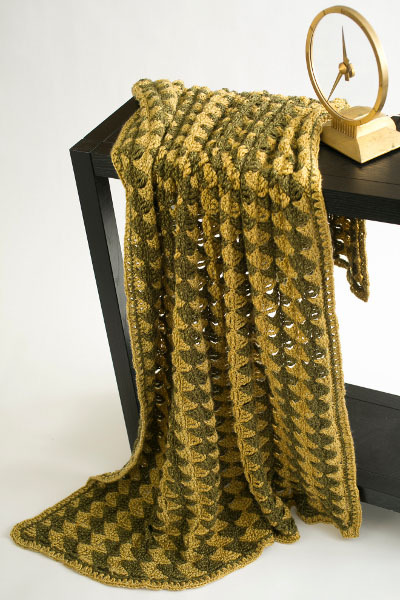 Stitches with different heights create zig-zagging triangles in this comfy throw. 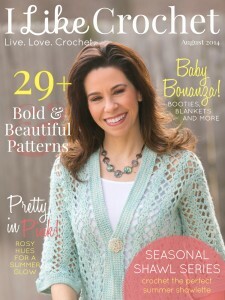 Crossed double crochet (cdc): Skip 1 st, dc in next st, dc in previous skipped st. Double treble (dtr): Yo 3 times, insert hook in next st, yo and draw up a loop, (yo and draw through 2 loops) 4 times. Double treble 2 stitches together (decrease 1 stitch) (dtr2tog): *Yo 3 times, insert hook in next st, yo and draw up a loop, (yo and draw through 2 loops) 3 times. Repeat from * once. Yo and draw through 3 loops on hook. 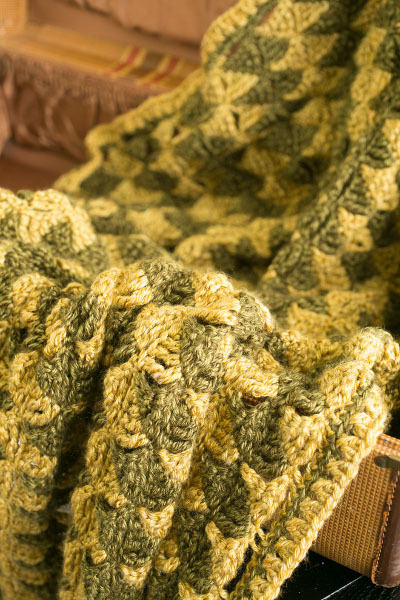 The throw is crocheted in rows. Borders are worked in the round. Row 2: Turn, join CC with sl st to first sc, ch 5 (counts as dtr here and throughout), *skip 5 sts, sc in next st, (working across underside of same wedge, sc in next st, hdc in next st, dc in next st, tr in next st,** dtr in next st). Repeat from * across, ending last repeat at **, dtr2tog in last 2 sts. Row 3: Turn, ch 1, sc in first st, (ch 6, turn, skip 1 ch, sc in next ch, hdc in next ch, dc in next ch, tr in next ch, dtr in last ch), skip 4 sts, *sc in next st, (ch 6, turn, skip 1 ch, sc in next ch, hdc in next ch, dc in next ch, tr in next ch, dtr in last ch), skip 5 sts, sc in next st.* Repeat from * across, sc in last st. Fasten off CC. Row 4: Turn, join MC with sl st to first sc, ch 5, *skip 5 sts, sc in next st, (working across underside of same wedge, sc in next st, hdc in next st, dc in next st, tr in next st,** dtr in next st). Repeat from * across, ending last repeat at **, dtr2tog in last 2 sts. Row 5: Turn, ch 1, sc in first st, (ch 6, turn, skip 1 ch, sc in next ch, hdc in next ch, dc in next ch, tr in next ch, dtr in last ch), skip 4 sts, *sc in next st, (ch 6, turn, skip 1 ch, sc in next ch, hdc in next ch, dc in next ch, tr in next ch, dtr in last ch), skip 5 sts, sc in next st.* Repeat from * across, sc in last st. Fasten off MC. Rows 6-49: Repeat Rows 2-5 11 times. Rows 50-52: Repeat Rows 2-4 once more. Rnd 1: With RS facing, join CC to corner of foundation chain. Working along underside of foundation chain, 2 sc in first ch, sc in each unworked ch and sc across foundation row to last st, 2 sc in last st, ch 2, working across side of of row, *work 7 sc in side of first dtr, sc in side of next row and 5 sc in side of each dtr across.to last dtr, 7 sc in side of last dtr, ch 2,* working across last row, 2 sc in first st, sc in each st across to last st, 2 sc in last st of row, ch 2, repeat from * to * across, join with sl st to first sc. Fasten off CC. Rnd 2: With RS facing, join MC to any corner ch-2 sp, ch 3 (counts as dc), dc in same ch-2 sp, *cdc across to corner ch-2 sp,** (2 dc, ch 2, 2 dc) in corner ch-2 sp,* repeat from * twice more, repeat from * to ** once, (2 dc, ch 2) in first ch-2 sp, join with sl st to top of first ch 3. Fasten of MC.